Simbavati Hilltop Lodge is situated in the world -renowned Timbavati Game Reserve on a beautiful small koppie, an ideal vantage point for stunning views of the Nhlaralumi River and the distant foothills of the Drakensberg Mountain Range. Simbavati takes its name from the local Shangaan language, translated as “the place where the lions come down from the stars”. Simbavati Hilltop Lodge boasts breath-taking views from individual luxurious tents, specifically arranged to create a unique village feel. 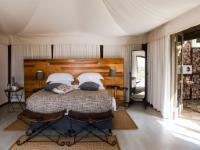 Privacy is guaranteed thanks to the careful placement of the tented-suites, ensuring an intimate and unforgettable stay. A pure authentic, tranquil safari experience in pavilion-style tents each comprising of two individual tents – a bedroom and a separate bathroom, linked by a passage that can be opened up on one side, allowing for a private outdoor shower experience. Enjoy magnificent views of the bush and safari wilderness from the unique contemporary styled lodge facilities, including a chic lounge and 360 degree bar, game-viewing deck, infinity pool and shaded pool lounge for relaxation or from your own private deck or daybed. Experience an exhilarating game safari exploring the abundance of wildlife, including the Big 5 as well as the unspoilt landscapes of the reserve. Game drives are conducted by an experienced field guide and Shangaan tracker in open 4X4 vehicles in the early morning and evening for exceptional game viewing when the animals are most active. Nocturnal animals, including the big cats are regular sightings at night. The Timbavati Private Nature Reserve is one of the few places in the world where you have the opportunity to see the unique white lion in their natural environment. The resident lion prides of Timbavati carry the recessive gene "chinchillia' that is responsible for this unusual anomaly and guests have a great chance of seeing these lions while on a game drive in the early morning and evening when animals are most active. ***Please note at Timbavati Private Nature Reserve, you will be required to pay a vehicle entrance fee of R 140.00 per vehicle and a conservation levy of R 328.00 person (subject to change without prior notice). The conservation levy is payable at the lodge or can be prepaid. 8 unique safari tents, offering king-size or twin beds. The en-suite bathroom tent is connected to the main tent via a small passage, with an opening to the outdoors that gives you an indoor or private outdoor twin shower. Simbavati Hilltop Lodge is approximately a 7 hour drive from Johannesburg. Please follow the signs to Simbavati River Lodge whilst the concrete crossing to Simbavati Hilltop Lodge is completed. S 24° 12’ 20.2” E 31° 19’ 24.2”. Do not type in Simbavati River Lodge into your GPS. The GPS will pick the lodge name up but will try and direct you through Kruger National Park which is not the correct direction. Please note you cannot access the Lodge through Kruger Park but only through the Timbavati Gate as per the directions below. Follow the tar road from the Eastgate Airport/Timbavati turn-off for 44 km straight to the Simbavati turn-off. (GPRS coordinates for the Simbavati turn-off: S 24° 12’ 20.2” E 31° 19’ 24.2”). Turn right onto the dirt road and follow the lion footprints for approximately 6.4 km to the lodge. On the tar road you will go through 2 control gates. At the second gate you enter the Timbavati Private Nature Reserve where you will pay a Vehicle Entrance Fee per vehicle. Keep your permit, as the Lodge will issue you with an exit permit when you return again. Please do not arrive at the lodge late, as you will then miss the afternoon/evening game drive and lunch, which is served not later than 16h00. If you are going to be late due to unforeseen circumstances, please let the lodge know on (015) 793-9051/3.